I love this time of year. School’s in session, pumpkin lattes are back, and more importantly, it’s fantasy football time. Every year, it’s played by over 25.8 million players in the U.S. Last year, the average player spent three hours a week working on their team—that’s 1.2 billion hours over a 17-week period. Apparently the Manning brothers were quite influential with their rap video last year, and millions of Americans relied on their smartphones to get updates and access their fantasy leagues. 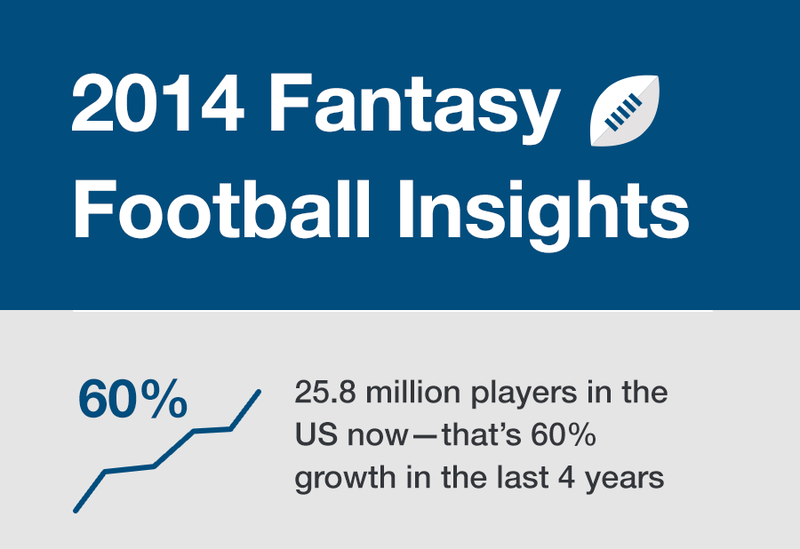 In 2013, 10 million Americans accessed their fantasy app during the start of the season. Mobile trumped desktop, with 130% of users using their mobile devices throughout the season to make lineup changes, check scores, and smack talk. Make sure your site is not only optimized for mobile but your engagement, content, and social tools are as well. Last year, 66% of players credit websites and apps in helping them make lineup decisions. Have your content found by using relevant keywords and posting content at the right time. In 2013, keywords like “NFL preseason rankings,” “NFL player ranking,” and “fantasy draft tips” spiked between August 15th and 31st. Keywords like “fantasy football,” “NFL rank,” and “NFL standings” were high throughout the season, specifically on Thursday, Sunday, and Monday—that is, on game days and the day after. Publish your content in good timing, and focus on relevant keywords so you can be found by your audience. And even if you don’t always write about sports, that’s ok. According to our data, Tom Brady was one of the most talked about QBs across the web, second only to Peyton Manning. But mentions don’t always indicate it’s football-related. It could be fashion, media, hollywood or sports-related. So don’t count yourself out of the SEO game. During the first week of the NFL last year, 30 million Facebook users were responsible for 60 million football-related posts, including likes and comments. Twitter users posted 1.4 million Tweets during or about the game. Throughout the season, Facebook and Twitter were the primary modes of social sharing, with 64% preferring Twitter to share and 28.6% preferring Facebook. However, the clickthrough rate was the same for both, at 50%. Get in on that action by providing a simple sharing tool to encourage your visitors to share your content both before and during game time. Yes, it’s true. Men make up a majority of the estimated 25 million players in the U.S., but women are jumping quickly on board—for different reasons. Twenty percent of fantasy sports players are women, and they’re increasing year over year to the tune of about 200,000 more females joining a fantasy league from 2012 to 2013. But women have a slightly different reason to play, other than being competitive of course. For women, it’s all about the experience—they have a common thread with other fantasy players that they might not have had otherwise. When putting together content, keep in mind that your audience is broader than you might think, and content for female football fans will resonate with a large audience as well. For any publisher, this is one of the outcomes you want when a visitor arrives on your site. If someone’s checking out an article about NFL preseason ranks, then, using our Pro Recommended Content tool, serve up an article about the top 10 quarterbacks or the best defenses in the league, for example. It keeps your visitors engaged on your site longer, and by using sharing buttons, you’ll drive more traffic to your site. And I think we can all agree that would be a touchdown! We created this cheat sheet infographic with top stats about fantasy football that’ll give you a jumpstart in your football content strategy! Previous PostWhat’s Happenin’ Around the Social Web? August 15-21Next PostWe Want to Hear Your Voice!